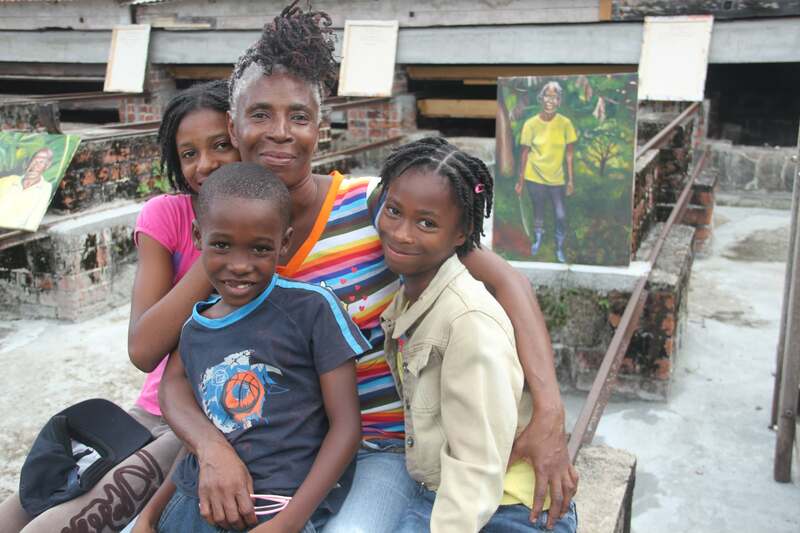 On Sunday afternoon at Crayfish Bay in St. Mark’s, a most unusual art exhibition took place. 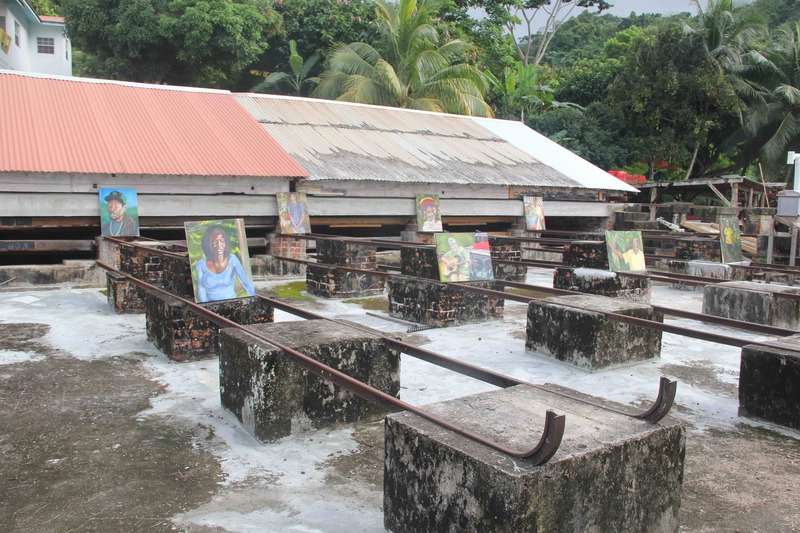 Nestled on the drying trays of the cocoa boucan, eight portraits sat, awaiting their unveiling to a most appreciative audience. Months in the making, the artist, Asher Mains, had painted in the traditional classic oil painting style, images of eight cocoa farmers. The farmers were the audience gathered there, and a few visitors who were staying at the Crayfish Bay guest house. The literati of art were absent, as were the politicians and TV cameras. No fashonistas stood with wine glasses perfectly poised, just hoping someone would notice their shoes. No paparazzi showed up. 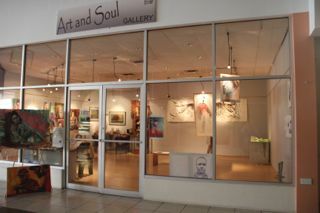 It wasn’t Art Basel in Miami. The speeches were simple and direct. 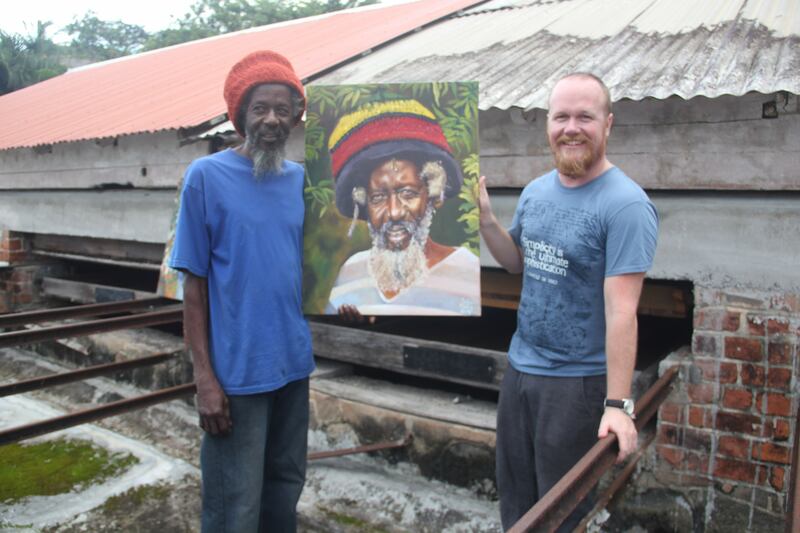 After Asher was introduced by his father, Reuben Mains, he explained the purpose of his art project. Then the portraits were handed over to their new owners. There was excited chatter. Children of the farmers suddenly looked at their parent in a different way. After many hand shakes, hugs, kisses, expressions of appreciation, the farmers walked away one by one, carrying their prize. I left that exhibition with a different feeling than any of the many exhibitions I had been to. It was a feeling that was hard to define. Happiness, yes, but more than that. These farmers, who had never been to the opening of an art exhibition, interacted with the portrait of themselves, but also with the portraits of others. There was critique, long looks, private smiles, pride, satisfaction. They talked about where in their house they would hang it. One person exclaimed that this was something she could leave for her son. Each person expressed simple thanks. As an artist and gallerist, there is always the pressure of sales, which always comes to a point at the opening of an exhibition. Not so this time. None of the work was for sale. There was no bargaining, offers and counter offers. Each one was being given to the person who the portrait was of. Its not that the work was free. It came at great sacrifice. Asher Mains, the artist, spent countless hours in the process of making this work. The first step was going to meet the farmers, spending time with them talking, taking video and stills, choosing the pose that would best suit the representation. Then came the lonely time in the studio, with only the canvas, the paint and the brush. For hour upon hour. Eight times. There was no funding or institutions paying for this project. This came from Asher’s thin pocket. Maybe the feeling I was trying to define was satisfaction; the art had done its work—it had created a bridge from the known to the unknown. Time will tell. In a few months, Asher will go back to St. Mark’s to see the farmers, to talk to them and find out what it has meant to them and their families to have art in their homes. 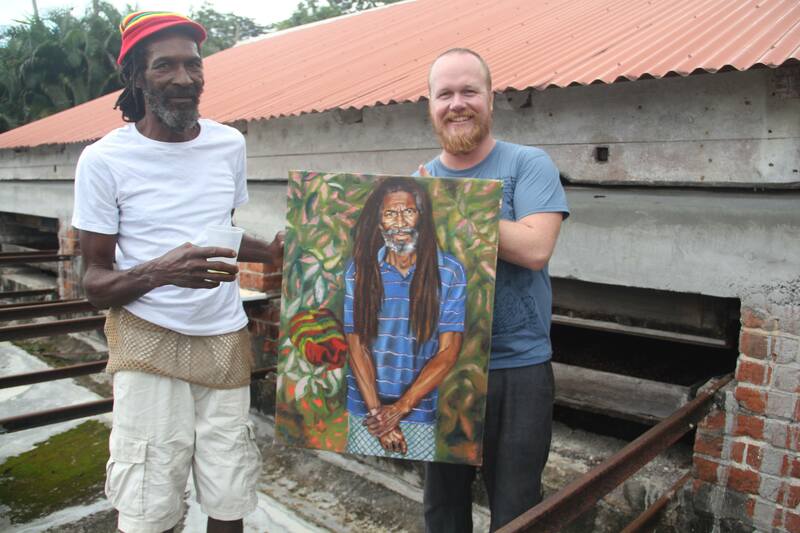 After painting and exhibiting for 20 of his young years, Asher Mains may now be on the brink of starting a revolution; the creative sector and agriculture powering forward to be the backbone of the Caribbean economy and identity.